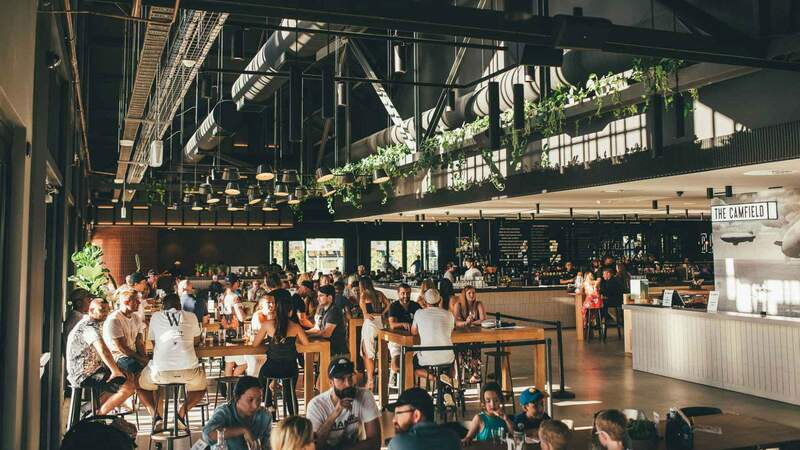 Whether you want to commiserate, celebrate or congregate, these sporty Perth bars have you covered. Big screens, quality pub grub and good-natured vibes are all crucial to a successful sporting bar. Many try, but not all get it right. Luckily for game-loving Perthians, the city has more than its fair share of match-friendly drinking spots. We're bringing you the best of them, in partnership with Heineken, whose icy cold lager can be found at some of Perth's finest. At any of these four bars, you'll feel right at home, whether you're high on pre-game nerves or post-match adrenaline. No ticket in your hand? Settle in for the ride in front of a big screen, where you'll be treated to front-row-like viewing all game long. The Game Sports Bar, within the Aberdeen Hotel, definitely has a competitive spirit. It’s here that you’ll find the biggest screen in Perth. And it’s just one among more than 35 sports-dedicated TVs. Whatever the source of your mania — be it NRL, AFL, basketball or cricket — you can pretty much expect a live stream. If you’re keen to escape the crowd, find a bunch of mates and book a booth for a private viewing experience. 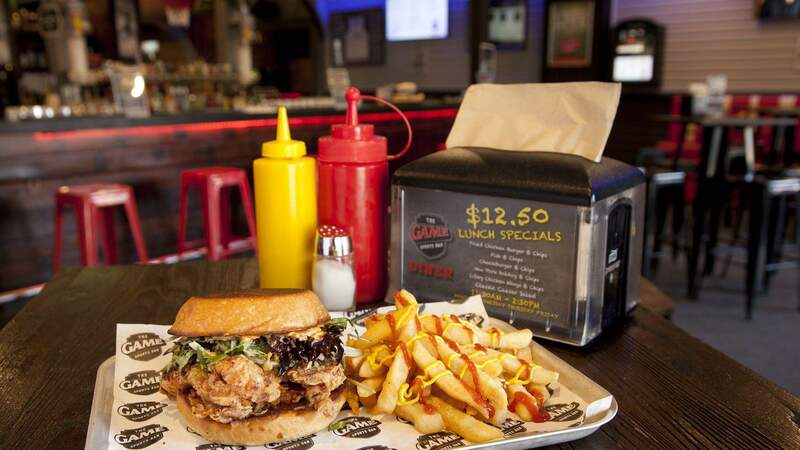 The menu is packed with big, American-style eats, including burgers, hot dogs and The Ultimate Manwich: slow-cooked smoked beef brisket, crispy bacon, cheddar, chipotle aioli, tzatziki and rocket on turkish bread. 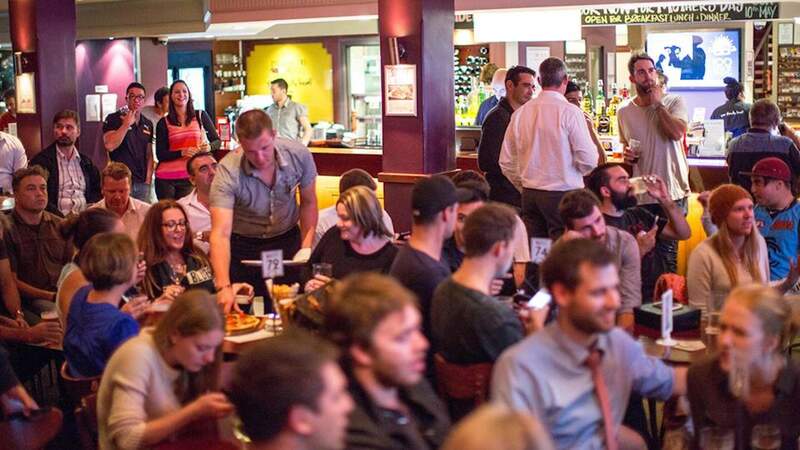 Mount Lawley’s Inglewood Hotel has stacks of screens dedicated to games of all kinds. Be your passion Test Cricket, the FFA Cup or the European Diving Championship, there’s a stool with your name on it. Fair warning, though: if you’re there to watch a match in the front bar, you can expect to be in the company of some pretty fervent fans, unafraid to express their triumphs (or disappointments) unabashedly. Got a quieter drink or meal on your mind? Head for the beer garden or the restaurant, where the menu focuses on burgers and generous pub classics, including beef, Guinness and mushroom pie, and garlic-rosemary lamb rack with duck fat roast potatoes, baby carrots, broccolini and red wine jus. Situated a stone’s throw from Optus Stadium, The Camfield is an obvious choice for pre- or post-game shenanigans. And, with a custom-built big screen and bean bags in the beer garden, it’s a pretty good place to be during the game, too. Part bistro, part microbrewery and part garden, The Camfield is the perfect place to set up camp. It slings tasty pizzas till late and a slew of sip-worthy beers. If you need a break from all the sporting fervour, head to one of the terraces and enjoy sweeping views of Swan River. 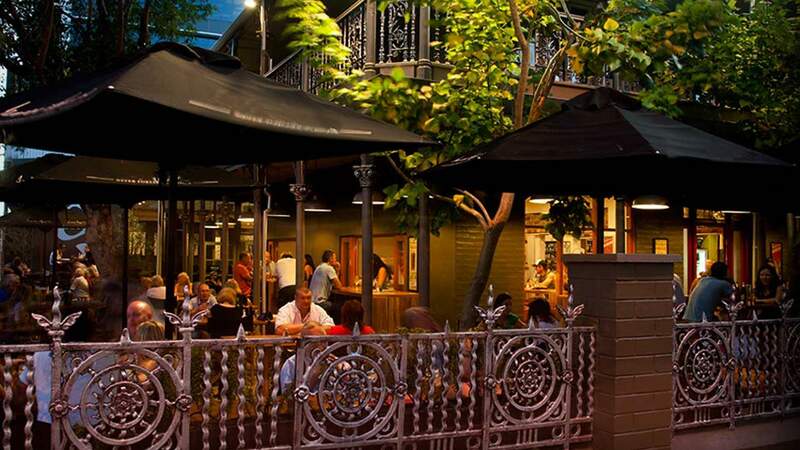 It’s touted as Australia’s largest pub and it’s the perfect place to toast a victory. 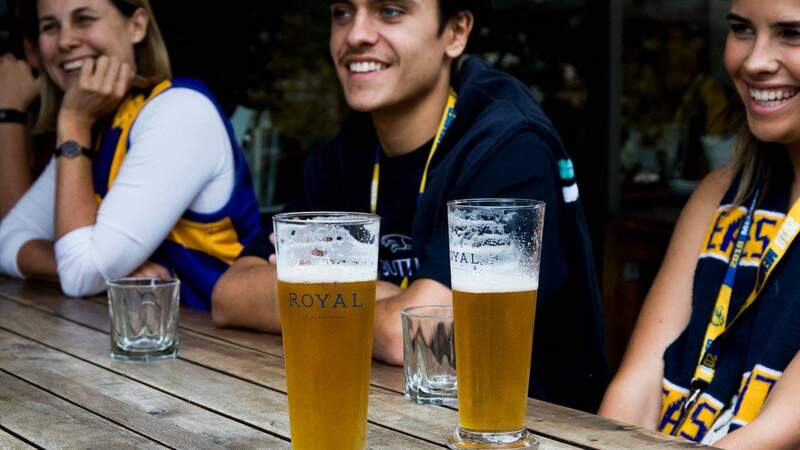 While it may be situated within the Perth Mint precinct, in the heart of the CBD, this iconic heritage hotel makes for the perfect watering hole come game day. With shuttle buses operating to and from Optus Stadium every 15 minutes, you won’t have to wait long till you’re in the beer garden with a brew in your hands post-game. The kitchen serves classic yet refined pub grub, like bangers and mash ($28) and surf and turf ($38), to give you the sustenance you need to support your team. Drinks wise, The Grosvenor boasts a great range of local drops, as well as a fantastic range of draught beer — it’s got something to suit all tastes, win or lose. Top image: The Royal on the Waterfront.